Recently we showed how to Christmas-ize your breakfast, lunch and dinner. But we saved the crudites for last. 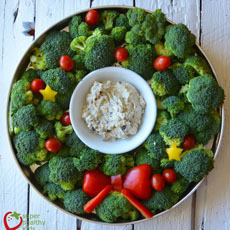 At any holiday gathering, it’s a good idea to have a raw vegetable platter (the French term, crudités, pronounced crew-dee-TAY, sounds much more interesting), along with hummus or a nonfat yogurt-based dip. But what can you do that’s special for Christmas? 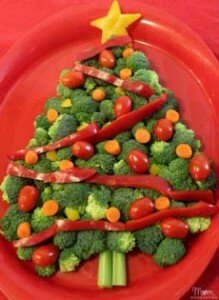 Turn the crudités into a Christmas tree or wreath. You can do it flat on a platter, or turn into a craft project with a styrofoam base: a cone for a Christmas tree or a ring for a wreath. And, you can assign it to the kids for their contribution to the festivities. Provide toothpicks to spear the mozzarella balls, olives, etc. For dessert, you can serve a low-calorie wreath or tree of fruit, like this fruit Christmas tree we featured previously. But it’s only one of the many options that creative cooks have put together. Here are more designs for fruit Christmas trees.